Excited to announce we have moved. Our new shop is located in the downtown Branson, Dino's Cake & Coffee Co. is a purveyor of fine hand-crafted cakes, desserts, specialty coffees and espresso. Our new location downtown offers immediate parking near our front door. It is a great place to stop while enjoying shopping in downtown. Pick up your Cake and Cupcake orders in minutes with ease. Look forward to serving you. The signature cake that started it all. You will love this cake! Rich chocolate butter cream center. A classic cake favorite with our special recipe twist. Beautifully textured cake covered in scrumptious white frosting. An exquisite European classic now available direct to you. Light, fluffy and delectable fresh coconut in every bite. Surprise flavors include Key Lime, Caramel Pecan and more. Creamy icing and gourmet taste. Scrumptious taste, enough to share. Handcrafted with whole or skim milk. Choose from a variety of gourmet teas. $.50 to any drink order. These 10" gourmet cakes easily serve 12-14+ people and are made with high quality ingredients. In cafe pricing only. Based on availability. Not applicable to special orders. These 10" gourmet cakes easily serve 12-14+ people and are made with high quality ingredients. In cafe pricing only. Please call us at (417) 334-0223 for special orders. Those beautiful and classic hymns that we all love, have been disappearing from many of todays churches and culture. We wanted to create something very special. Dino has put together 101 hymns played by him on the piano; available to you. Each CD has 25 hymns. this makes an amazing thing to play at your church, to be used as background music, and to worship. This can also be used as a tool to minister and would make for an amazing gift to your family, friends, pastor, and of course yourself. you can order yours today by clicking on the link below. Thank you for your support and loyalty. Many blessings. 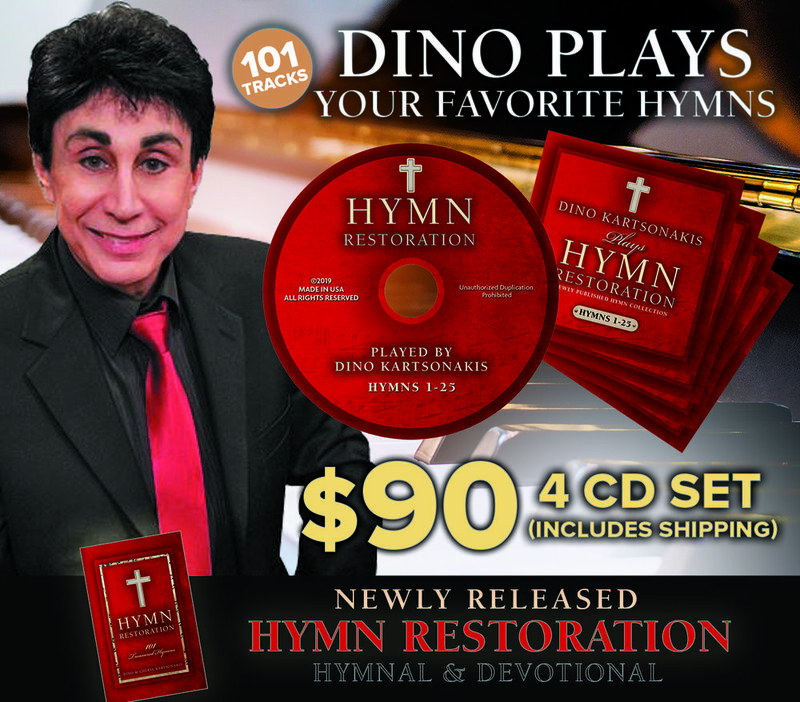 PRE ORDER - DINO’S PIANO ACCOMPANIMENT TRACKS- 4 CD’S OF 101 HYMNS FROM “HYMN RESTORATION 101” HYMNAL. It Is my pleasure to accompany you as you sing along as I play these amazing Hymns. Purchase the first for $20 with 25 hymns.